The U.S. Department of Commerce granted a request from Argentina to initiate "changed circumstances" reviews of U.S. trade duties imposed on Argentine biodiesel companies. 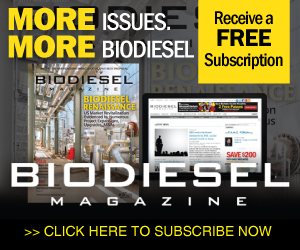 What's changed is Argentina has raised its biodiesel export taxes and prices. On the heels of completing a major expansion project at its renewable diesel production facility in Norco, Louisiana, from 160 MMgy to 275 MMgy, Diamond Green Diesel will add another 400 MMgy of production capacity expected to come online in 2021. Phillips 66 and REG announced Nov. 1 that planning is underway for the construction of a large-scale renewable diesel plant adjacent to Phillips 66's Ferndale Refinery in Washington State. The plant will use REG's proprietary BioSynfining technology. REG announced its financial results for Q3 2018. Net income attributable to common stockholders was $24.3 million in Q3 2018 compared to net loss of $11.4 million in Q3 2017. The improvement reflects better margins as well as more gallons sold. A group of 60 organizations representing diverse business, energy, transportation, real estate and agriculture sectors has sent a letter to leaders in U.S. Congress on the pressing need to address the tax provisions that expired at the end of 2017. NBB members voted Nov. 13 to elect their trade association leadership. The board reflects the wide range of member companies in the biodiesel industry from feedstock operations to producers. The election was held to fill eight board member spots. Neste Corp. and Clariant have signed an agreement to partner in developing and making new sustainable material solutions accessible to a variety of industries. Clariant will start by making ethylene and propylene from Neste's renewable diesel.